The primary aim of the sabbatical (May – July 2007) was to explore the relationship between creativity and spirituality with particular reference to my own work as an artist. I began on the Isle of Skye, partly as a simple break but also to gather images to work on later. I then went to Edinburgh, speaking to other artists about their work and spending time at Leith Art School – where I could cheerfully have stayed. 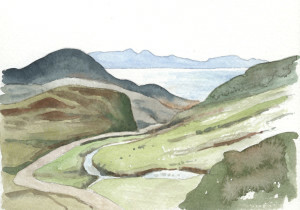 The remainder of the time (apart from a couple of short family holidays) was spent in a cottage in the Lake District, walking, reading, praying, drawing and painting. The ‘art’ of creating is, I believe, as much a spiritual thing as a physical and emotional thing. That is, if you like, the physical thing – the practical activity – but, the Bible also says that God looked at what he had made and saw that it was good. (God is) ‘. . . a Creator who, in an act of divine self-limitation, relinquishes control of his creation, allowing it and its creatures to be self-creative as we seek for beauty and goodness and truth, and struggle to learn the meaning of the stewardship of nature, the power of reconciliation and the language of love’. We also believe that God made us ‘in his image’. Perhaps that means we resemble God in some way but it could also mean that we have certain qualities or attributes which are like God. Hence we too have the ability to think, to imagine and to create. The difference perhaps is that only God creates from nothing. God is the Creator – we are merely creative. In other words we can only make something out of that which already exists – our God-given imaginations and the resources and materials that are around us. So, it follows then that what we create may be unique in one sense but it is not so much ‘original’ as ‘individual’. 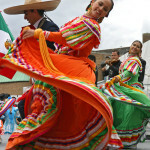 But creative ability and the desire to create are wonderful gifts – gifts from God. It was Descartes who coined the phrase: ‘Cogito, ergo sum’ – ‘I think, therefore I am’ and there’s a lot in that. For the artist it’s more a case of ‘Fingo, ergo sum’ – ‘I create, therefore I am’ (Colin Renfrew: ‘Figuring it out’ Ch.1, p.36) – and I can identify very much with that statement. I can’t put my finger on quite what it is or why I respond to the visual world in a particular way and why I need to take photographs, to draw and to paint – I just do – and in some way it also makes me who I am. Now I think I would want to say a bit more than that. For example I could be walking along a road and throw a brick through someone’s window. That says: ‘I was here and I did this’. But to my mind it’s not a creative activity – it’s destructive. In his defence, however, I should add that for Richard Long, the activity has to have minimal disturbance of the location. 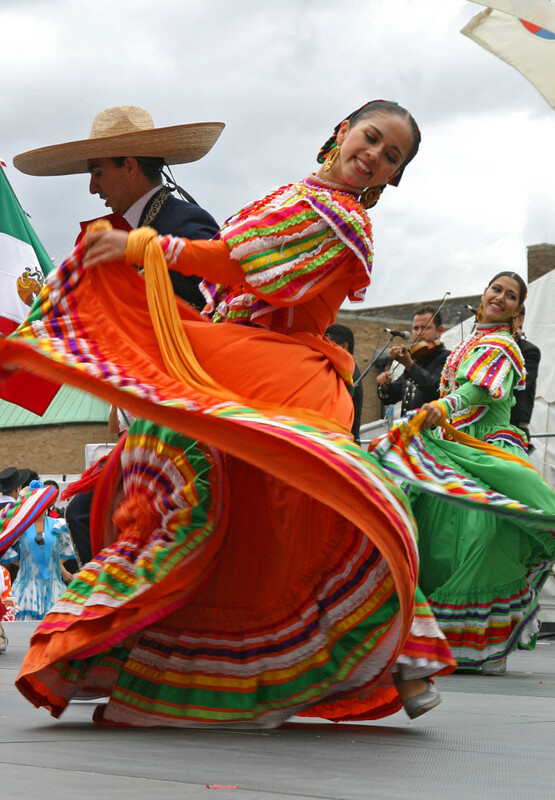 I want to see art as a celebration of my response to who I am, as well as where I am, what I see and experience. It’s also about what I think and feel and, because I can’t always define the latter, at least not in words, that’s one reason why I need to draw and paint. In art there’s also something about ‘capturing the moment’, whatever that moment may be and however we choose to interpret it. Looking back I think drawing and painting for me have always been about ‘capturing the moment’ in the sense of recording what I see through the medium of pencil or paint. But, at the same time I don’t simply want to represent what was out there in a cold, mechanical way. My emotions are also caught up in the process – how I feel about things: (a) the subject, object, whatever it might be and (b) what is happening on the paper – trying to be open to new possibilities. 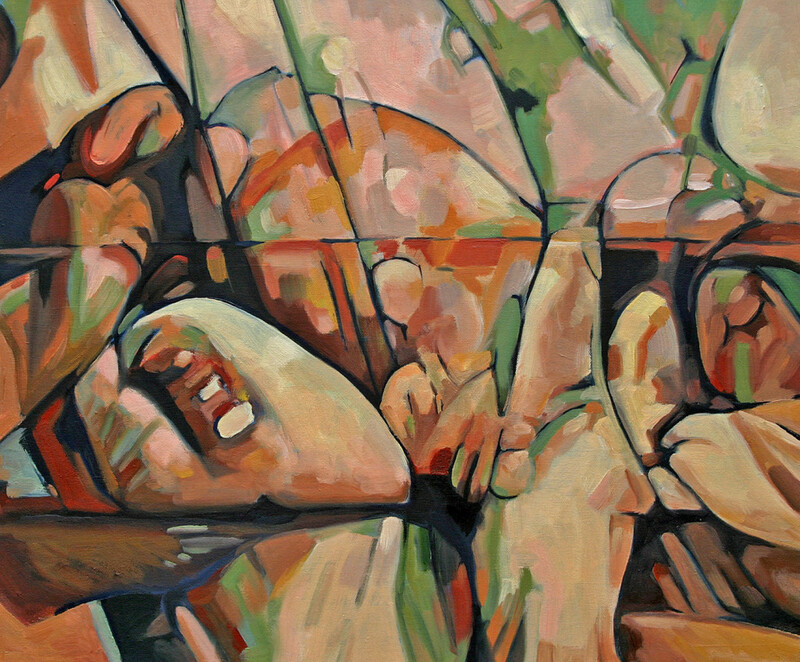 Because of the latter, however, I was aware for some time of wanting to break out into new ways of working – going beyond the merely representational. But I felt trapped. And the more I tried, the more frustrated I became. I did get close from time to time but it wasn’t really happening. I then went to Lesotho. 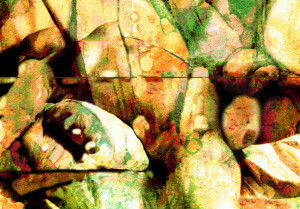 Now, you may be expecting me to say that it was African art that inspired me. But it wasn’t. 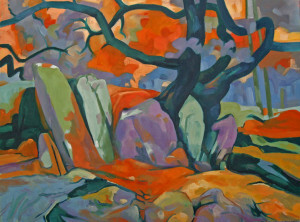 What did inspire me was the landscape – and more especially the colours in the landscape. In fact it didn’t just inspire me – it set me on fire. 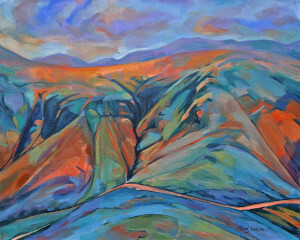 I also began to realise that I would struggle to respond to those colours using watercolour ans I began to think in terms of painting in oils, a medium I hadn’t used for about 20 years. 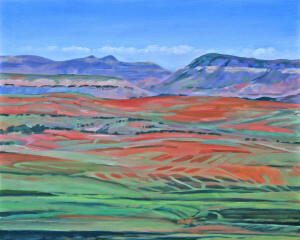 The dominant colours in the landscapes were vivid greens and rich, fiery red-browns and oranges. There were also some other colours – soft blues, greys and purples (usually in the distance). 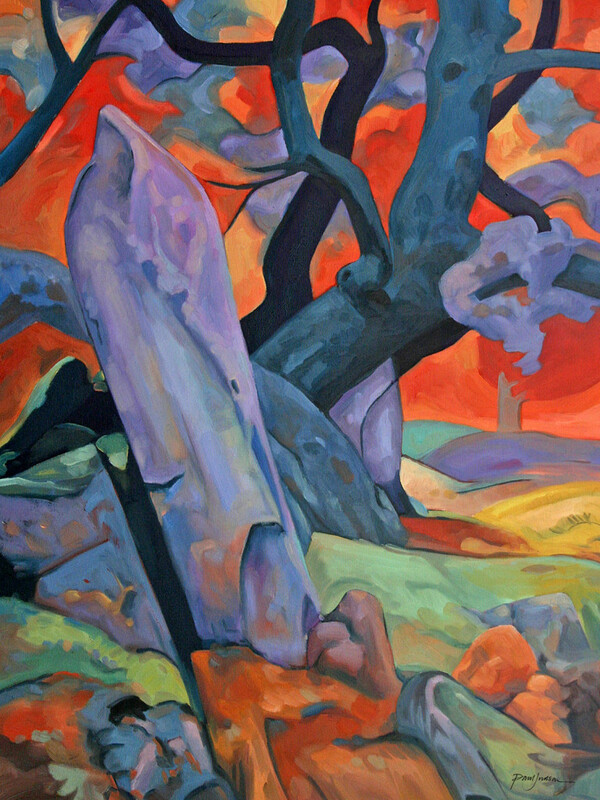 But it was those very strong, complimentary colours which really gripped me and they became my basic palette for a whole series of paintings which followed. And my sabbatical (which I now knew was to be sometime during the following year) had a sense of calling – something positive to aim for. That was November 2006. I then had to wait. Amazingly, the waiting time actually proved to be a lot easier than I would normally have expected. Looking back I had a sense of something going on but I wasn’t sure what it was. It would now seem that this was actually quite fertile period – a time of germination (like seeds under the ground). I didn’t have lots of ideas – in fact I was very much a blank page – but perhaps that was important. I just hoped that, when the time came, I would be able to paint. But there were no guarantees. Experience told me that I am often at my most creative (ie when ideas come and the desire to draw and paint is at its strongest) when I’m busy with other things. Then, when I do have time set aside it’s as if the incentive dies. So, there was genuine concern that, given the time specifically to do something creative, I wouldn’t have the necessary creative energy. But let me go back to the beginning – well not to the beginning because for as long as I can remember I have always wanted to draw and paint – to be creative. But for our purposes today – to the beginning of the sabbatical – which began on the Isle of Skye. While I was on the Isle of Skye I came to the conclusion that time was a very important factor. I was blessed with perfect weather which helped me to relax – and I had time to be. I didn’t have to do anything in particular or be anywhere at a particular time. Also I was not responsible for anyone else. There was, however, a sense of responsibility to make good use of the precious gift of time I had been given. But part of that ‘good use’ could be to waste time creatively – a luxury that many of us can’t normally afford. In fact, that was my main concern. As I said earlier, traditionally, I get most of my creative ideas when I am busy with other things. But often, when I then have time to put those ideas into practice, the motivation isn’t there. So, how was I going to respond to 3 whole months with all the time in the world? Part of my reason for going to Skye was to collect images which I could use later as a basis for paintings. I also did some drawing and watercolour sketches. And I experienced the wonder of nature and the glory of God. 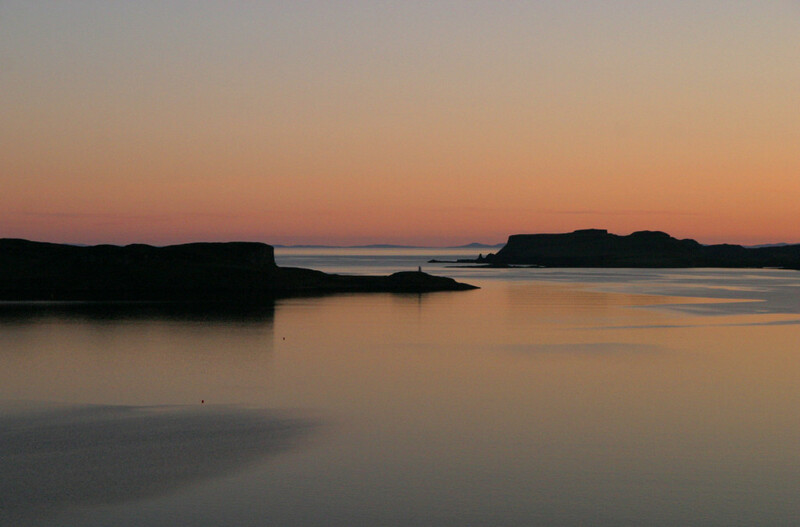 For example, the sun going down over a perfectly calm sea, immediately followed by the full moon rising over the Cuillin Hills. A beautiful glistening white beach reaching down to an azure blue sea (It could almost have been the Bahamas). Or climbing to the Old Man of Storr and finding myself above the clouds which were rolling in around the mountains. Awe inspiring! 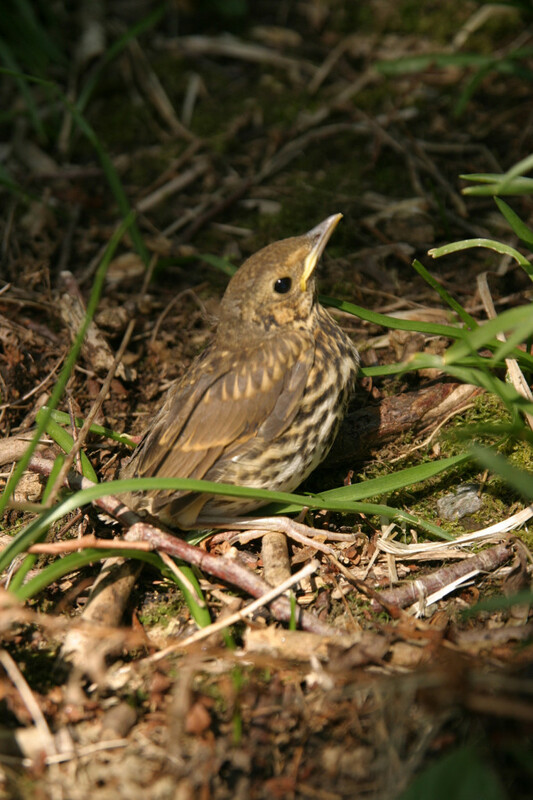 Then there was a very close encounter with a baby song thrush and a daytime visit from a tawny owl (my favourite bird). 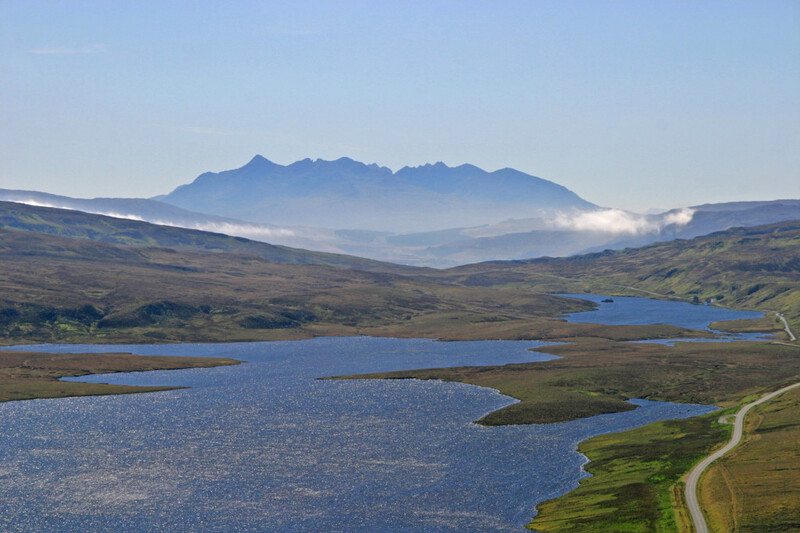 It was all very intriguing – and what’s more – the weather was perfect (very unusual for Skye!). After Skye I stayed in Edinburgh for a few days and met up with some other artists to reflect on what motivates their creativity. I was also privileged to spend the day visiting Leith Art School and talking to the students. The emphasis here is very much on drawing and painting and I could cheerfully have signed on. It was great to be in amongst people exploring paint as a medium and I came to the conclusion that there is something deeply spiritual about the smell of creative activity. 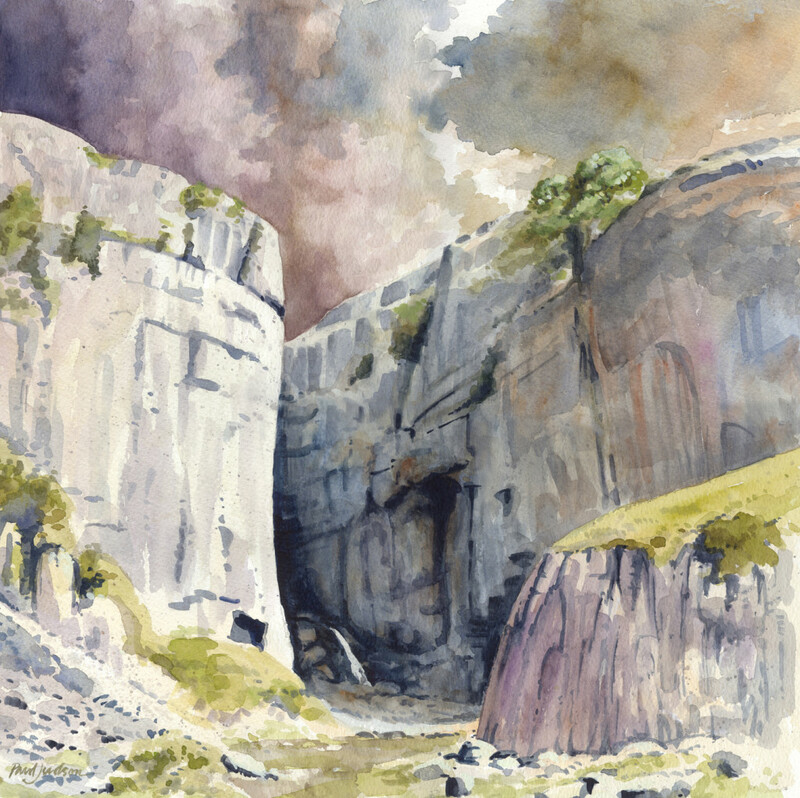 During my travels and image-collecting, two themes had emerged, one of which was ‘journey’. I felt as though I was on a journey – a time of exploration and discovery. I was learning about myself and I was learning more about God. 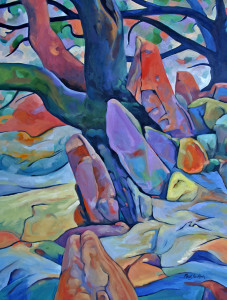 For me what links art and spirituality is the sense of wonder. Responding to beauty (or at least something that inspires admiration), being grateful for the gift of it, and then making something new happen as a direct consequence. What happened to me during this special time was a new sense of freedom and confidence. 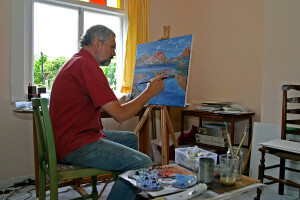 I was the one holding the brush, mixing the colour, deciding what should go where . . . but there was something else happening. Something far deeper than anything I’d ever experienced before – eg. this picture – Don’t Ask of Us Where. In other words I don’t believe it’s necessary to be restricted by what we experience in the world around us (although there’s nothing against that) but we can use shape, colour and so on as a response to the inner self. The other theme didn’t in fact appear until I was in the Lake District. I was drawn (forgive the pun) back to a place I had painted before (2005). 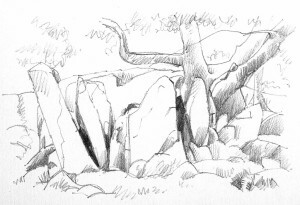 It was in Borrowdale, on the edge of a small wood and what appeared to be a group of trees which had burst their way through some rocks. In fact, it turned out to be one tree – an oak – with three main trunks and a lot of contorted branches. There’s a sense of the whole group being held in tension and I was intrigued by the energy and power that was in it. 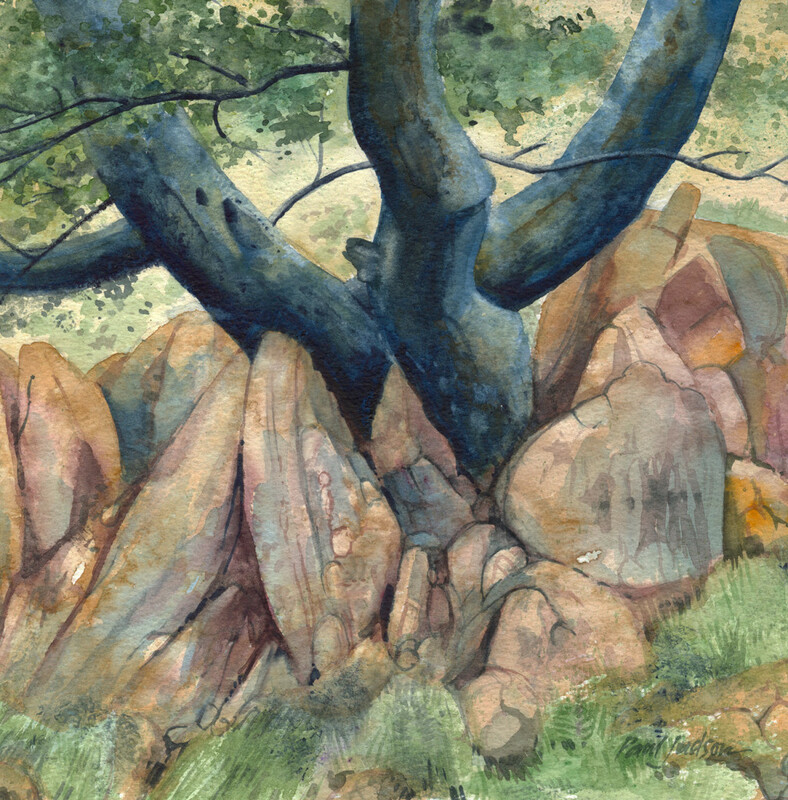 So much so that, eventually, the majority of the work I did was based around these rocks and the tree (more of that later). I was also reading a book at the time called ‘Figuring it Out’ by Colin Renfrew. 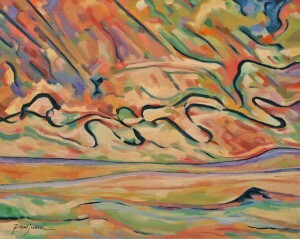 Colin Renfrew is an archaeologist who is fascinated by the connections he’s observed between archaeology and visual art – or rather between archaeologists and artists. And, of course, it is the latter that the archaeologist is exploring and attempting to explain or understand as he/she excavates the past and put things into context. This had particular resonance with the theme of ‘journey’ which I was exploring and in fact, it led directly to a trilogy of paintings which I called by those titles (see below). 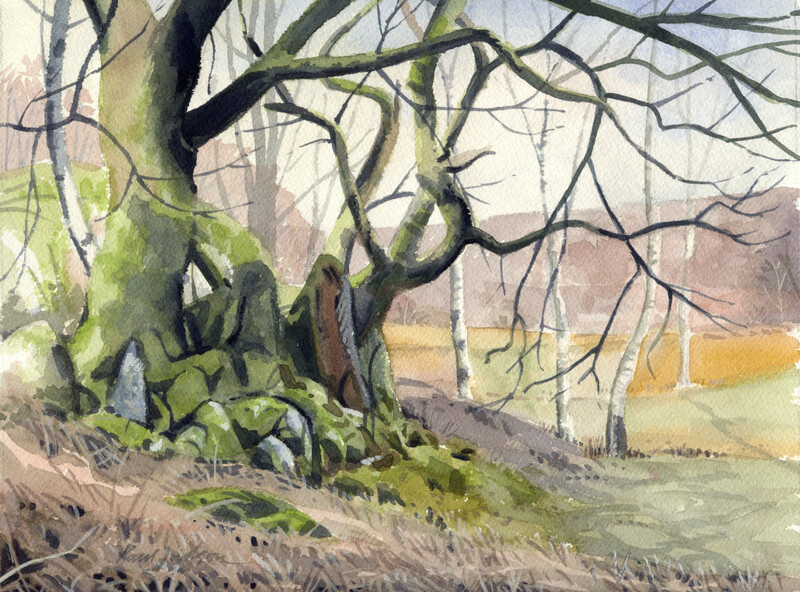 I am now going to look in a bit more detail at some of the paintings I produced during my sabbatical. 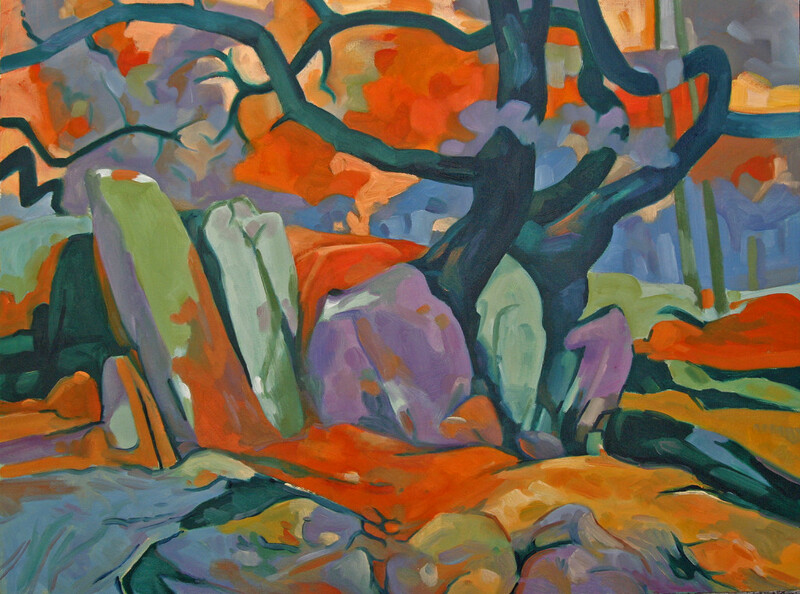 I have always had an interest in the natural world and much of my drawing, painting and photography has focused on landscape, exploring the effects of light, the colours, patterns and textures in nature, and so on. My sabbatical was no exception. It’s difficult to actually pinpoint the starting point for the ‘journey’ theme but this was certainly one of them – ‘Shoreline’. 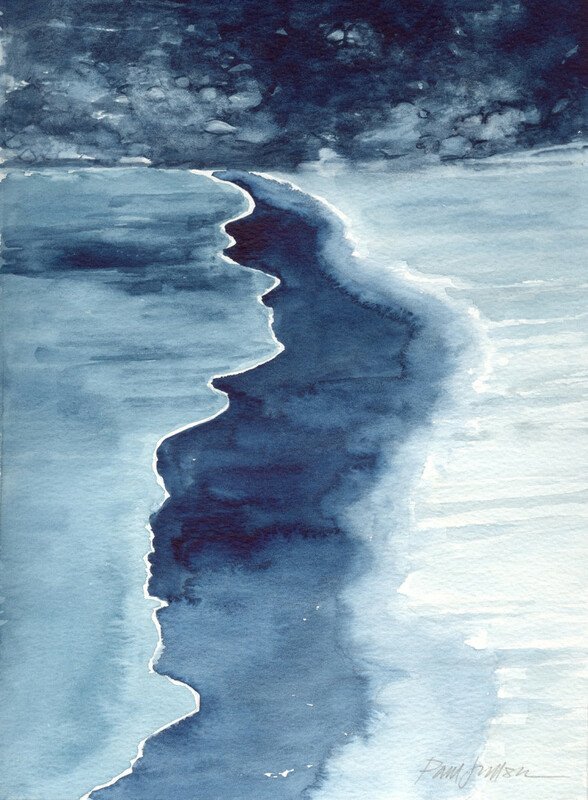 It is a watercolour study of the edge of the sea as a white meandering line set against the dark shapes of the damp sand reflecting the dark rocks above. It was this linear shape which actually became the symbol for the pathways etc. of several of my ‘journey’ pictures. It was almost as if, having seen it here, I was hooked on it , and couldn’t avoid seeing it in lots of other situations. Hence ‘The Journey Continues’ – travelling away from Ben Nevis (this was while I was en route to Skye) down the valley with the pathways and hillsides emphasising the dramatic perspective of depth and distance. 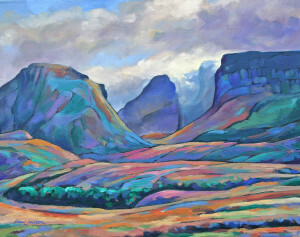 You will remember that I was also using a particular colour theme – a basic palette of reds, browns, greens and blues – inspired by the colours in the Lesotho landscape – and in fact that range of colours still inspires the work I’ve been doing since the sabbatical some of which can be seen in the Gallery section of this website. 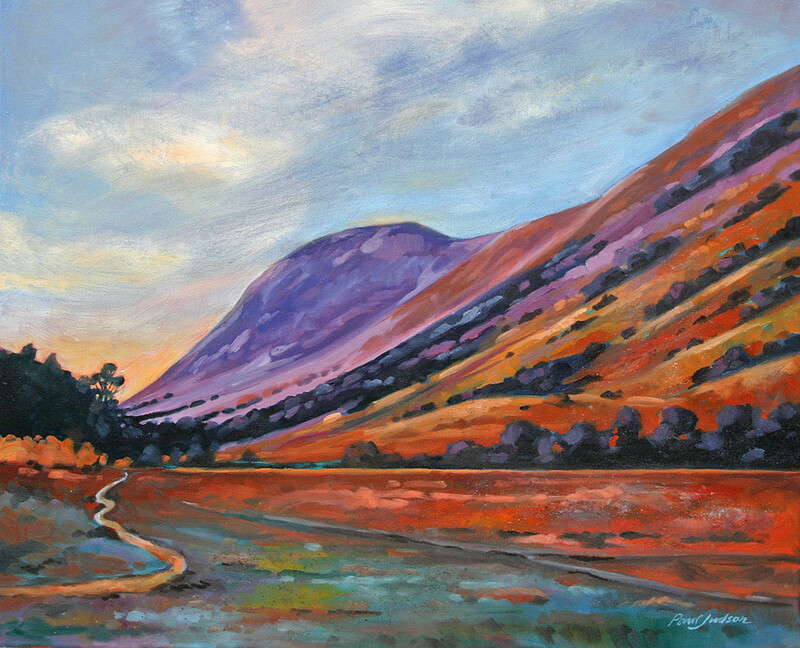 The next 3 paintings are all based on studies from the same vantage point – a hill between Buttermere and the Newlands Valley. ‘Don’t ask of us where’ (pictured above) makes use of the same linear shapes superimposed on the landscape looking down the valley with its paths, streams and the road. And the title (a line from an R S Thomas poem) is suggestive of a confused sense of direction – something I was experiencing in those early days. ‘Concerto for Two Violins’ (see also About my Pictures) With this picture I began, as I often did with a quick waterolour sketch (sometimes this might be a pencil drawing or a photograph instead depending on how much time I had). I was intrigued by the relationship between the meandering line of the stream and the straighter line of the road and it occurred to me that it would be interesting to try a reverse image overlapped on the original. I then worked on this basic design with some colour – mixed media (watercolour and pastel). 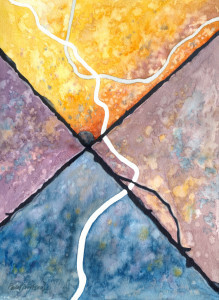 As I worked on the idea it came to me that the lines of the road could represent the basic tune while the overlapping lines of the stream suggested the overarching notes of the two violins – hence the title. 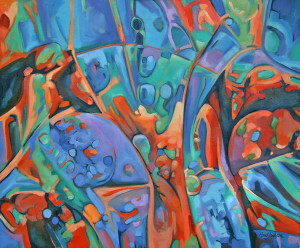 And in the final painting (oils on canvas), as you can see, the colours became much brighter to give the image more energy and make it more fitting to the music on which the title is based. 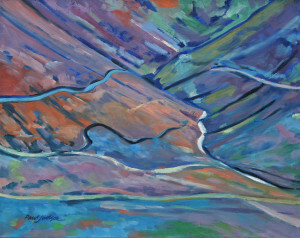 ’Winter Blues, Newlands Hause’ is the third painting based on the studies from that particular vantage point although the painting itself came along much later. The road is the line which loops over the small hill in the foreground and the deep crevasse in the centre of the picture contains a waterfall. The high vantage point also means that the hills beyond are visible. 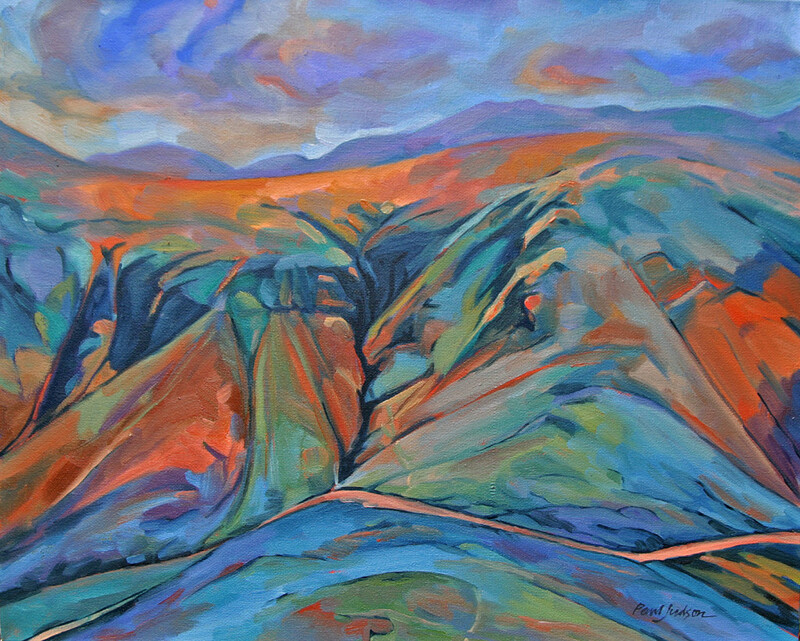 Whereas in the previous two pictures, there is no sky visible, I wanted the sky in this painting to be seen as more an integral part of the landscape. ‘Heading for Home’ While I was photographing the moon rising above the Cuillins on Skye, I turned round and saw this tiny cottage set against the dark silhouette of the hills with just one lit window – and I thought – ‘I’m going to have to paint that’. 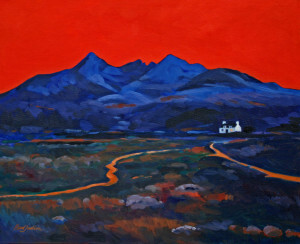 It was also a good way of using the dramatic skyline of the Cuillin range and by adding the red sky I wanted to make the picture even more dramatic. 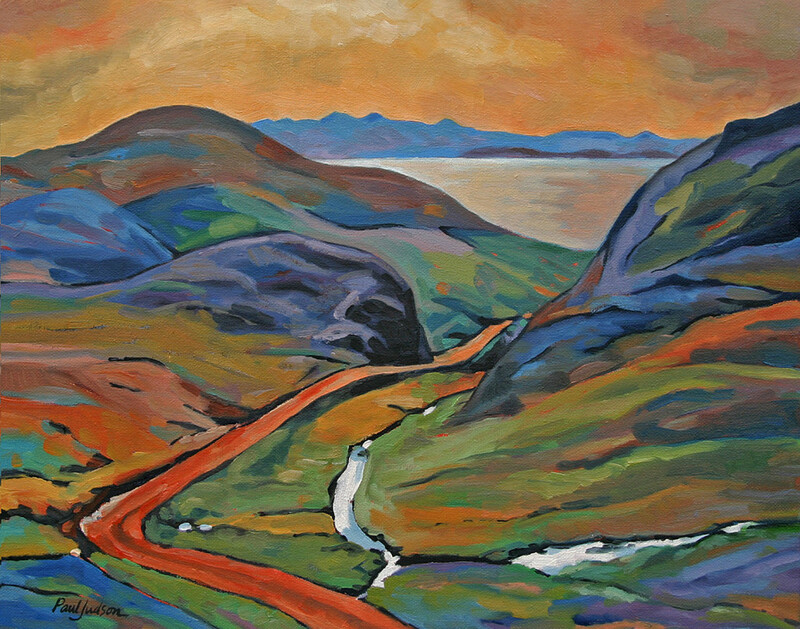 ‘Red Road to See Rhum’ I came across this view while walking to the southern end of Skye and I was fascinated by how the view changed as I walked down to the coast. So much so that I stopped every so often on the way back up the hill and made a series of drawings. This fitted in very well with my recurring theme and I planned a trilogy of pictures of this farm track with the view out to sea and the Island of Rhum in the background. ‘Red Road 2 and Rhum’ was the second in the series and ‘Red Road and Rhum 3′ was the third. See Gallery. ‘Trail 1’ This watercolour is based on some snail trails across paving slabs. I’d noticed this while sitting outside the cottage one morning enjoying my breakfast and it struck me how similar the lines were to the linear shapes I’d been using in my drawing and painting. So, I took some photographs and developed this painting from those. 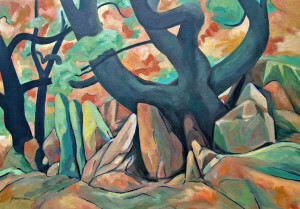 We now come to the other theme which became almost an obsession – TREE & ROCKS. 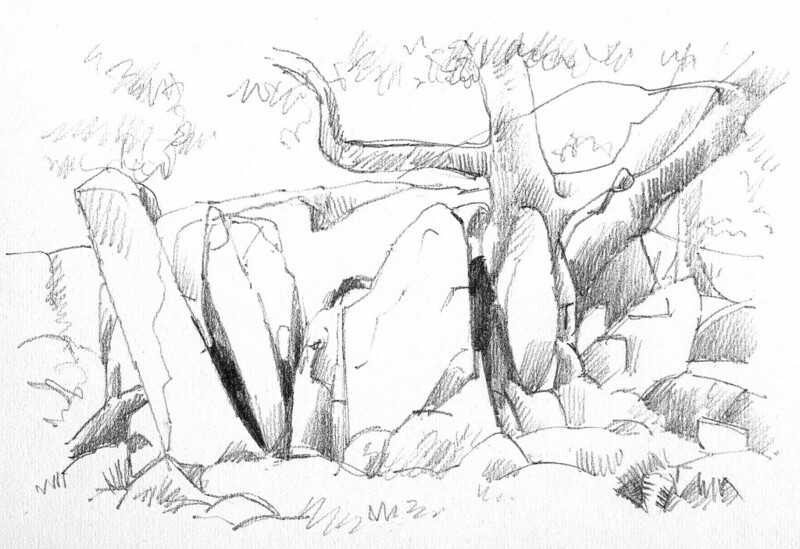 I explained earlier how I’d been attracted to this group of rocks and the tree growing out of the them. And I began by simply soaking myself in the subject – using a method which I’ve explored with groups for reflection and meditation. It’s a similar approach to landscape or our environment that we would use if we were engaging in ‘lectio divina’ – sacred reading. There was something about this place and these rocks and tree which really got to me – I spent ages, sitting, looking at them, drawing and photographing them from different angles and did some fairly detailed watercolours where I tried to use the paint in a more experimental way. ‘This Tree Rocks or The Council Tree’ – 1st stage: This was the first of a series of oil paintings based on the studies of the rocks and tree and I was trying to get away from the idea of foreground-background – foliage – sky etc. 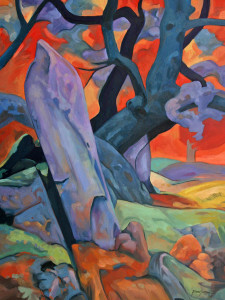 To reinforce this I deliberately kept the colour range simple, avoided natural colours and very similar tones. The odd thing was (well, perhaps not so odd) that when I’d finished it looked as though the scene was bathed in evening light. 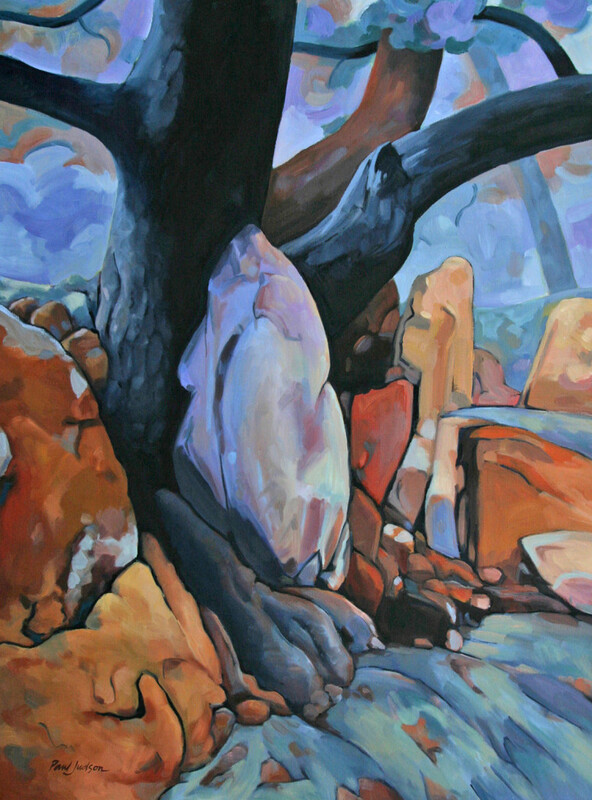 ‘This Tree Rocks or The Council Tree’ – Final stage: I then hit on the idea of the white patches (these were in fact patches of lichen) and this helped to take away the effect of warm light and add to the flattening of the subject. 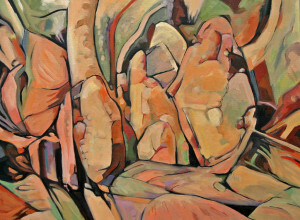 I was also conscious of really letting the paint move in an almost ‘expressionist’ way and the rhythm of the foreground especially had echoes of the pathways I’d been exploring in my other paintings. 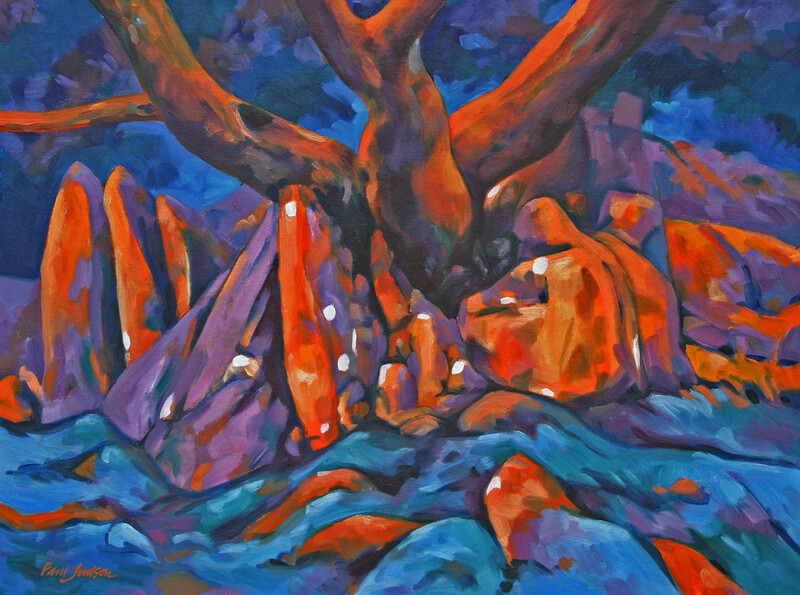 I originally called the picture ‘This Tree Rocks’ because of the vibrant colours but the full title I’ve ended up with was suggested by the group of stones – especially the one on the right which looks like a seated figure. ‘Fantasia on a theme (of rocks and tree)’. With this picture, I deliberately set out to soften the colours I’d used in the previous picture with the result that it is much less dramatic with an almost romantic feel, hence the title. ‘Tree and Rocks 5’ This picture also includes the second tree in the group and was originally painted in the same range of colours as ‘The Council Tree’ but I didn’t like it so I reworked it using a softer range of colours. ‘Tree and Rocks 6’ This watercolour study took a different view of the subject – close-up and a in vertical format and was the starting point for the trilogy of paintings – ‘Where do we come from?’ . . . etc. 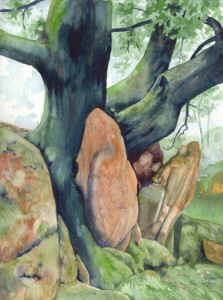 Whilst I was working on this watercolour study it occurred to me that the way the base of the tree almost ambraces the large rock is reminiscent of the way a penguin holds its egg between its feet. The rock itself also has an almost womb-like quality. 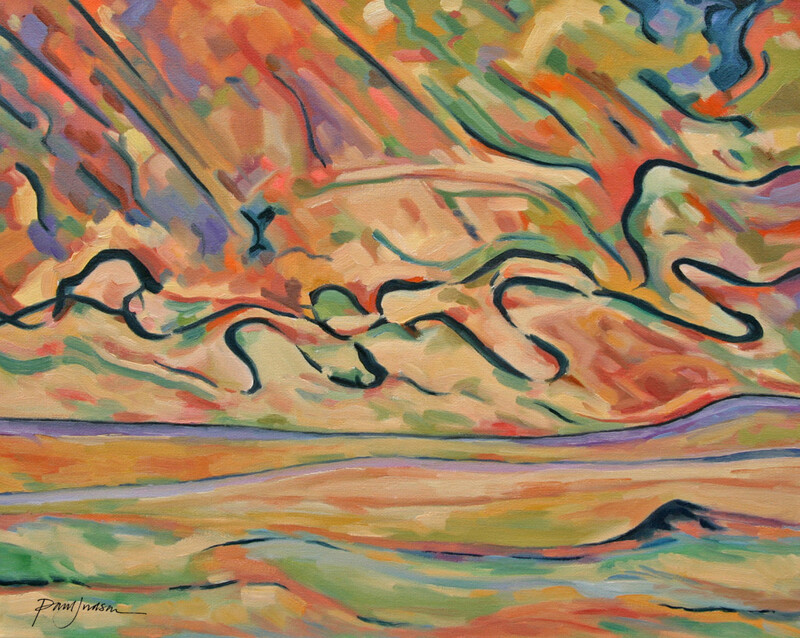 And reflecting on this made me begin to think of Colin Renfrew’s theme from the Gauguin painting I have described above. And that was the trigger for the trilogy of paintings which followed. ‘D’ou venons nous? Where do we come from?’ With the first picture I was keen to emphasise the effect of cold light (dawn) and the prominent shape of the rock which could also be seen as being held between the feet of some primeval beast. It could also be seen, as I’ve described as an egg or as a womb – which echoes the theme of ‘origins’ and ‘birth’. Que sommes nous? What are we?’ In the second of the trilogy the group of rocks and tree are viewed from the other side and in this picture I tried to create a sense of order and belonging, nothing too dramatic, nothing out of place. But there also had to be a slight feeling of mystery about it – something hidden perhaps and so, the question What are we?’ remains. ‘Ou allons nous? Where are we going?’ In this, the third picture in the set of three – I wanted to recreate something of the atmosphere of the ‘Fantasy on a theme’ picture but with stronger, more dramatic colour and a feeling of looking into the unknown. ‘Where are we going to? 2′ Three becomes four! After completing the set of three pictures, I decided to add a fourth to the series and this time I wanted to be freer with the way I used the paint and the colour giving a more vibrant, dramatic effect – less mysterious perhaps but with a sense of expectation and hope. 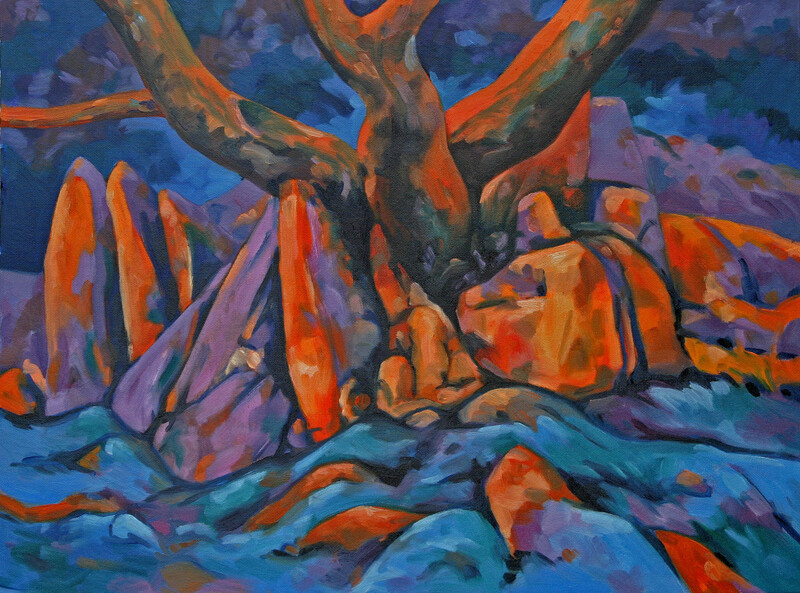 ‘Rocks and Roots’ – another variation – a close-up of the rocks and some of the roots that entwine round them – with a more monochromatic use of colour. 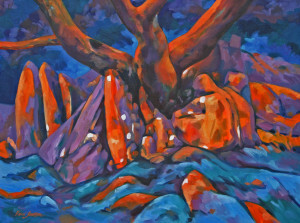 ‘Rock Pool’. 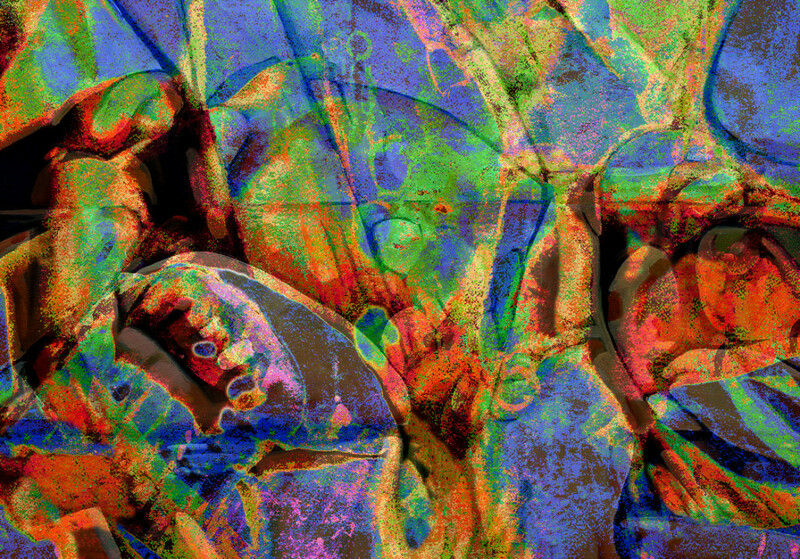 One of the things I enjoy doing is playing around with photographs in Photoshop – overlapping the images and manipulating the colours. This painting was based on one of the pictures that came out of that process using some of the images of rocks. ‘Blue Rondo’ The most abstract of all the pictures I produced. In music a rondo is where a simple phrase is repeated and I used that idea with the small blue shape being repeated in various places. Also, there’s a jazz composition by Dave Brubeck called ‘Blue Rondo a la Turk’ – and I took the idea for the title from that. I often listen to jazz when I’m painting and I’m sure it influences the way I work. ‘No Safe Ascent’ A painting of a waterfall that pours down from Chapel Craggs and into Buttermere – Sour Milk Gill. 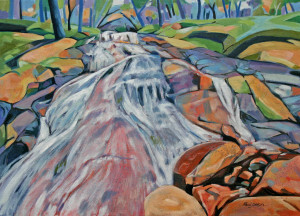 I’ve always enjoyed painting waterfalls and I was keen to try an ‘ordinary’ landscape using a similar approach and range of colours as before but using the shapes, colours and tones to create more of a flat pattern. Surprisingly though the picture still demonstrates a degree of perspective. The title is taken from a notice displayed at the bottom of the falls advising people that it is not safe to try to climb that way. 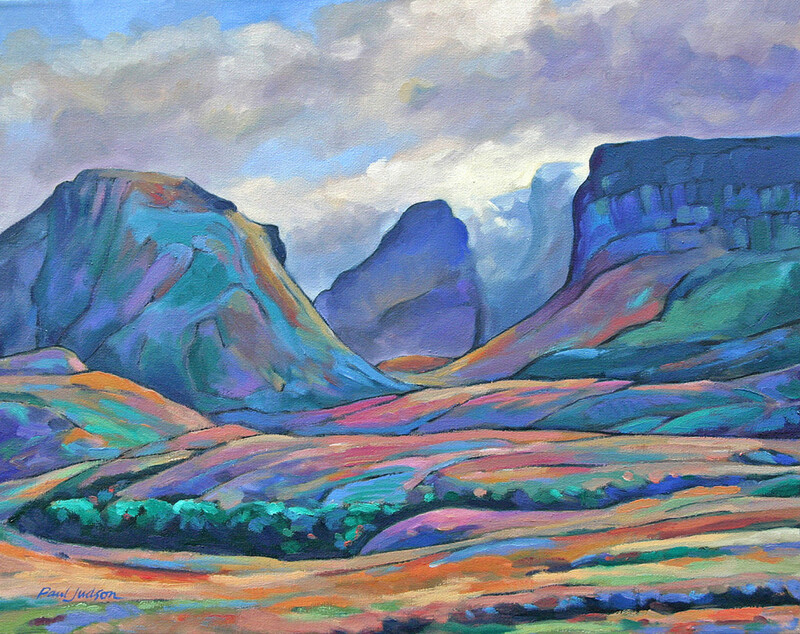 ‘Misty Mountain – Rainbow Moors’ The last painting from my sabbatical and back to Skye. 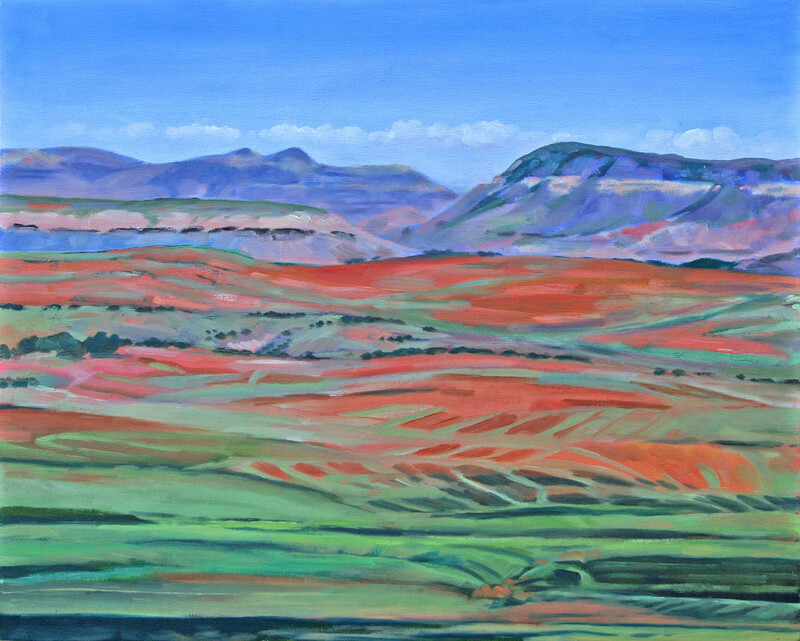 This is another reasonably straightforward landscape in one sense but using the same range of colours so as to emphasise the decorative pattern of the hills and moorland and also focus more on the surface of the painting rather than the perspective in the picture. I returned from my sabbatical with a real sense of knowing that I’d experienced something completely new and transformative. I’d been given a really precious gift – the gift of time and the freedom to explore painting in a way that I’d never known before. Through this time set aside, I have realised that, for me, what links art and spirituality is the sense of wonder. 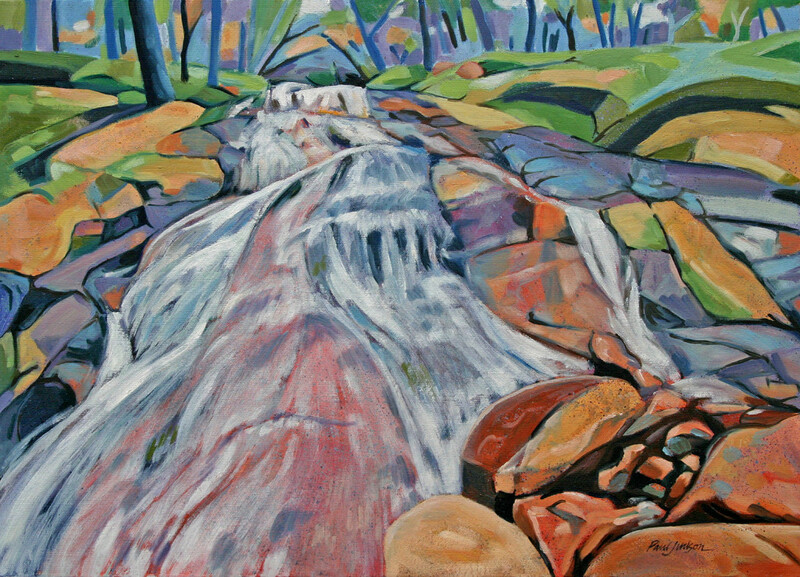 Responding to beauty – or at least something that inspires admiration – being grateful for the gift of it, and then making something new happen (in my case through drawing, painting or photography) as a direct consequence. I also experienced the new sense of freedom and confidence which I have described above. And, it confirmed what I have always known but never quite been able to express, that being an artist is what defines who I am. And so – the journey continues . . .